There isn’t a single show on television which has gotten sports fans buzzing quite like UNITE, which airs every night, Monday through Friday on ESPNU. It’s a blend of sports and comedy and one of the breakout stars of the show is comedian Reese Waters. To listen to the podcast on aarontorres-sports.com, please click here. For the next week, most channels that cover or broadcast any sort of sports programming will be awash with one thing: college bowl games. Of course, there are a few that matter: the national championship, the Rose Bowl, the Fiesta Bowl, and maybe your alma mater. But for the rest of the dozens and dozens of bowls with names like The Doritos Taco Locos Detroit Motor City Bowl, there’s little to actually care about. So how do you keep your interest up when you gather with the guys to throw back a few brews and watch third-rate teams play for one last time this season? Follow this advice from sports comedian Reese Waters, host of ESPN’s late-night entertainment show UNITE. ESPN college football analyst Danny Kanell, comedian Reese Waters and television host “Marianela” Pereyra will take a seat on the UNITEcouch weeknights at midnight ET on ESPNU as the hosts of the network’s first late-night entertainment show. Debuting Monday, August 27, they bring an expertise to sports, humor and pop-culture. Kanell joined ESPN in 2010 as a college football analyst. He brings a student-athlete perspective to UNITE after playing football and baseball at Florida State. Kanell was drafted by the Milwaukee Brewers out of high school and the New York Yankees in college, but followed his passion for football post-college and played in the NFL for the New York Giants, Atlanta Falcons and Denver Broncos. Viewers have seen a sample of Kanell’s take on both the lighter and analytical side of college sports during his previous ESPNU appearances. His expert football analysis will continue not only on UNITE Monday through Friday, but also every weekend during the college football season on ABC’s Saturday game. Waters has been applying a sly wit of comedy truth to sports news of the day as a stand-up comedian for several years. Hailing from Prince George County, Md., he has appeared on the late-night television circuit numerous times as a guest and was named by New York Magazine as one of the city’s “Ten Comedians To Watch”. Throughout his college years at Columbia University, Waters performed anywhere and everywhere, including showcases at comedy clubs and impromptu performances in dormitory lounges. His visibility has dramatically increased since, with stints on Comedy Central and Versus Network, and his passion for sports will translate into a nightly roasting on ESPNU. “Marianela” has covered everything from music videos and interviewing the biggest names in entertainment on FUSE TV and MTV to college football tailgates on ESPNU Road Trip. A night-owl by TV trade after hosting NBC’s “Poker After Dark” Marianela will conduct live interviews with athletes, fans and experts as the host of the network’s first live midnight entertainment show. The 24-hour college sports television network airs more than 650 live events annually and offers over 600 original studio shows. ESPNU has seen a steady increase since its inception on March 4, 2005 and is now in over 73 million households. The brand is also available in high definition on ESPNUHD, now in over 20 million homes. The network has long-term carriage agreements with all 10 of the top multichannel TV providers – Cablevision, Charter, Comcast, Cox, DirecTV (Channel 208), DISH Network (Channel 141), Mediacom, Time Warner Cable, Verizon FiOS TV and AT&T U-verse. Check out Reese on Bob and Tom Radio. Rooftop Comedy, the leading interactive media producer of original comedy content, is proud to announce the release of Reese Waters’ debut comedy album – The Content Of My Character. The title is now available for purchase on iTunes, Amazon, RooftopComedy.com and other comedy retailers. Proudly a self-­‐declared nerd, Reese has risen to be one of the most popular comics in the legendary New York comedy community. New York magazine recently named Reese one of their Ten Comics to Watch—and for good reason. After diving into the club scene, Reese won crowds over at the New York Underground Comedy Festival and Caroline’s Comedy Competition. Riding this wave of buzz, Reese launched into the television world, appearing on MTV, Michael and Michael Have Issues (Comedy Central), and Good Morning America—managing to squeeze in back-­‐to-­‐back appearances on late night TV and his own Live at Gotham special for Comedy Central in there as well. Reese also paired his sly wit with his strong passion for sports, serving as co-­‐host for The Daily Line on the Versus network. Hailing from Washington, D.C., Reese has a unique approach that makes him a captivating comedian. Whether he’s bringing new insight into doggie bag etiquette, subtle effects of the recession, or Tiger Woods’ love life, Reese has a quiet and sharp perspective on life that makes him a pleasure to hear. The Content of My Character showcases Reese’s knack for cool and collected comedy. Reese is the kind of comic you want to kick back with and hear him talk about his interview with Mike Tyson and, as he has been known to do, his drunken rendition of Usher’s entire catalog—even the new stuff. Whatever happened to the days when a loser knew it was a loser? I’m sick and tired of this “everyone’s a winner” nonsense we’ve perpetrated to make all our children soft. We all saw none of you even nominated for the real show, the BET Awards, yet you had the audacity to hold your own event–for the loser’s bracket? To make matters worse, you didn’t even ask Taraji P. Henson to participate. Who’s responsible? O, thats right, Fox. 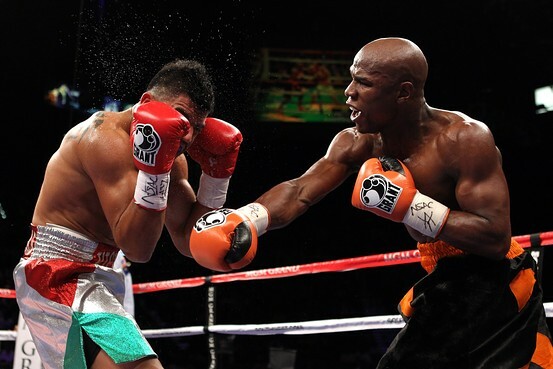 I was deeply upset by Floyd Mayweather’s controversial knockout win over Victor Ortiz Saturday night. If you missed it, in the fourth round, Ortiz drove Mayweather into a corner and during a flurry of punches, sent his head into Mayweather’s chin. Referee Joe Cortez jumped into the fray, stopped the action, and signaled for a point deduction on Ortiz. The two fighters tapped glove and an embarrassed Ortiz stepped forward to hug Mayweather – a move quite common after a foul in boxing. Mayweather leaned forward, as if to acknowledge the apology, and then plastered Ortiz with a short left hook. Ortiz flew back and glanced toward the referee in protest. As Ortiz looked away, Mayweather drove a straight right to Ortiz’s chin and he crumpled to the canvas and was counted out. 11. Not only was neither fight intoxicated, noone in either corner was seen holding a blunt. I don’t know what you call what happened Saturday night, but it’s certainly wasn’t a fight. Did you see the surveillance footage of the MGM parking lot afterwards? Now that was a fight.